With a lot more people playing Madden 16 Draft Champions Ranked the past month, I thought I make a few one formation schemes out OF different playbooks to help assist you in your draft champion cfm and ranked games. Analysis: Being as Ace is a balanced formation, it gives you the ability to flip the play without tipping off your opponent. Analysis: The idea is to have the streaks stretch the secondary deep, while the underneath receivers keep the linebackers short allowing the crossing route room in the middle. 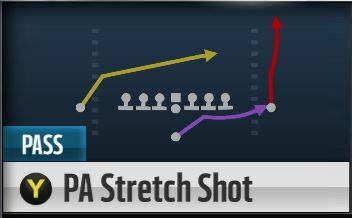 Hot Routes: A (X on PS4) on a streak and Y (Triangle on PS4) on a slant route. RB (R1 on PS4): You look to dump it off to the running back, if he’s not guarded running to the flats. 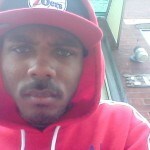 Y (Triangle on PS4):): Lead pass to the sidelines, once he get inside position on his defender. X (Square on PS4): Lead inside once he starts running across the field. 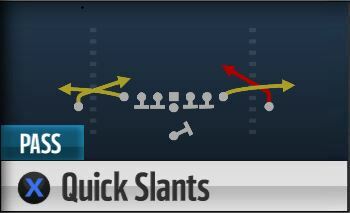 B (Circle on PS4): If you’ve made it to him he should have 1-on-1 coverage deep. Y (Triangle on PS4):): You want to fit the ball in between the flat defender coverage the running back and the nearest hook zone. X (Square on PS4): Wait until he’s nearing the middle of the field to determine if he should get the ball or not, because by that time you can judge whether you’re leading him straight into a safety or a linebacker is close enough to pick it. Analysis: Forces defenses to be balanced because you’re attacking both sides of the field with the same concept. Y (Triangle on PS4): Throw a quick dumb off if he’s open in the flats. X (Square on PS4): Bullet inside once X makes his break. B (Circle on PS4): Bullet inside once B makes his break. 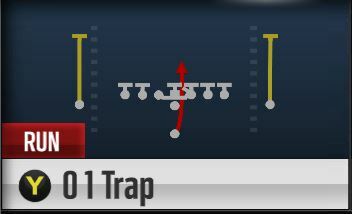 A (X on PS4): Throw a quick dumb off if he’s open in the flats. X (Square on PS4): Fit the ball in between the flat defender and the nearest hook zone. You want to look to the area in between those two defenders, to determine how close the inside defender will be. B (Circle on PS4): Fit the ball in between the flat defender and the nearest hook zone. You want to look to the area in between those two defenders, to determine how close the inside defender will be. A (X on PS4): Throw a quick dump off if he’s open in the flats. Analysis: Determining which run to choose is all up to how the defensive line and secondary lines up. HB Dive works best when the offensive guards have no lineman in front or to the right of them allowing them to get to the 2nd level, clearing a lane for the running back to run behind. While 01 Trap takes advantage of the linemen blocking the guard’s path to the 2nd level, by allowing them into the backfield on purpose only to box them out with a linemen from the other side. Leaving a huge lane in the middle of the defense to run through. 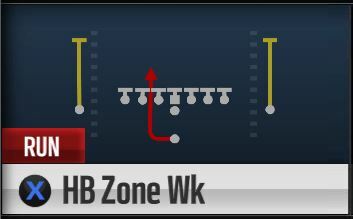 Lastly HB Zone Wk is made for when the secondary brings a safety in the box and you run to the opposite side.